There are so many details I love about this little mug. 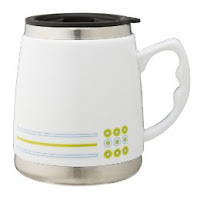 The stainless steel is sensible but the mug doesn't have that excessively industrial look many travel mugs have. The design is deliciously vintage, and so is the color scheme. And the handle molds to your fingers. Seriously design-conscious and affordable. From Target.